This tutorial will provide detailed information on how to create a dump backup file of your database. This is a good practice and you may consider creating a backup of your Joomla database on a regular basis. This way, if something goes wrong on your website, you will be able to restore it back to a working state. To create a backup of your database, you first need to confirm it's exact name. You can see such information within the configuration file of your Joomla website. For more information on that, you can review our tutorial on How to locate and edit the main configuration file in Joomla. The next step is to access the phpMyAdmin service within your cPanel account. It will allow you to review the database set on your website and take a backup of it. To do so, you need to log into your cPanel account. 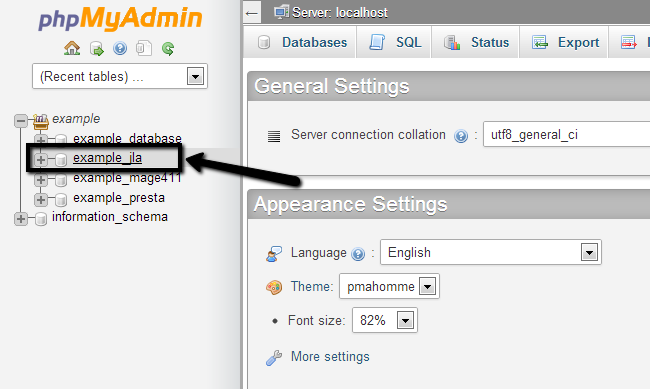 Locate the Databases section and click on the phpMyAdmin service. Select the database that you wish to create a backup for. It will be located on the left-side of the screen. Click on the Export button from the top-menu. Click on the GO button, which will complete the process and export the database backup on your personal computer.